Hi, I am interested in your 1979 Pontiac Firebird (stock #4787-CHA) listed on Autotrader for $25,995. I'd like to get more information about this vehicle and confirm its availability. 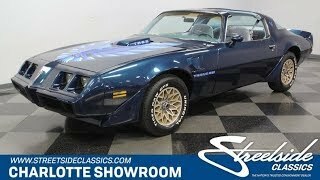 There was just something a bit meaner about the 1979 Pontiac Firebird Trans Am. So you tend to take note when you find a one-owner car that has a terrific color combo, the right investments, its original V8, and those iconic T-tops. Theres something very cool about the factory-correct Nocturne Blue with all the light blue accents. After all, that war bird on the hood is as artful as it is intimidating. Plus, the widebody appearance is pure aggression the headlights are individually separated; there are large flares for each fender; and the spoiler covers from end-to-end across the rear. The designers really wanted to get this T/A back to the wide track look! And everyone loves the attitude that comes from the side scoops and the shaker hood. But take some time to enjoy the details, too, like the dual exhaust tips that exit below the rear marker lights on each side and the cool snowflake wheels that have a standout gold finish. Inside, this T/A has been given a terrific upgrade. The blue vinyl was replaced with a gray/blue velour. This kind of comfortable cloth is an especially nice on the days when T-tops are out and youre enjoying the sunshine inside. Plus, power windows, an AM/FM/cassette stereo, and an armrest center console continue this comfortable feeling. Youll slip into the bucket seat, adjust the tilt wheel to the cozy setting, and set off on any adventure in comfort. With the full instrumentation looking great set in the iconic and aggressive machine-turned instrument panel, every trip can be a bold one. The 4.9-liter V8 has an authentic appearance right down to the factory shaker hood that is just sooooo cool. This is the original power plant for the car, and the tidy appearance suggests plenty of the right investments. Make sure you take a closer look, because it gets even better. There are factory marking and decals throughout the engine bay and undercarriage for a true time-capsule style appearance. But more than just look cool when parked, this V8 T/A fires up nicely and makes great muscle car sounds out of the exhaust. The Trans Am has a reputation for not only being quick, but also as one of the best all-around handling sports cars of its day. This is from features like the front disc brakes and sway bars front & rear. Plus, this one has long-haul comfort thanks to a TH350 three-speed automatic transmission and power steering. Quite interesting, nicely invested, and an all-around stunner, this one-owner Trans Am is for those who like a different kind of bold. So if you want to stand out in all the best ways, call today!